The Duchess of Cambridge is spending a second day in hospital for treatment for severe morning sickness. The duchess, who is thought to be under 12 weeks pregnant, is expected to remain at King Edward VII hospital in central London for several days. 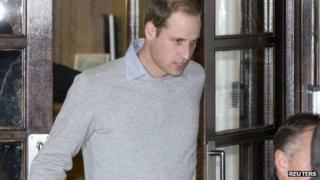 The Duke of Cambridge spent a number of hours at the hospital on Monday. Her admission prompted an unexpected announcement of the pregnancy, which has seen the couple receive congratulations from across the world. The baby will be third in line to the throne after Prince Charles and Prince William. The duchess is suffering from hyperemesis gravidarum, which causes severe nausea and vomiting, and the main danger is dehydration. The condition can require supplementary hydration and nutrients. Dr Peter Bowen-Simpkins, medical director at London Women's Clinic, said: "People who get it get intractable vomiting and may lose as much as 10% of their body weight and become very dehydrated. "When this occurs the simple treatment is to get fluids into them - and usually they feel considerably better." Dr Bowen-Simpkins also said the condition was "more common with a multiple pregnancy", adding the couple "would know by now whether there were twins there or not". It is not uncommon for pregnant women to experience morning sickness, particularly during the first few months of pregnancy. But some women (around one in every 200) experience severe nausea and vomiting, which continues throughout pregnancy. The main danger is dehydration - it can be difficult to keep enough fluid down orally. Doctors can treat HG with medication to help ease the nausea. HG is unlikely to cause harm to your baby. However, if it causes weight loss during pregnancy there is an increased risk that your baby may be born with a low birth weight. It is understood the duchess is being cared for by gynaecologist Marcus Setchell, who delivered the Countess of Wessex's two children. Catherine and William, who are both 30, were married at Westminster Abbey in April 2011. The duchess was last seen in public on Friday when she visited her old school, St Andrew's, in Pangbourne, Berkshire. During her visit she was involved in a brief game of hockey. In a statement on Monday, St James's Palace said members of both the Royal Family and the Middleton family were "delighted with the news". "As the pregnancy is in its very early stages, Her Royal Highness is expected to stay in hospital for several days and will require a period of rest thereafter," the statement added. Media captionElly Hargreave, who had pregnancy sickness: "For Kate the joy of pregnancy is being tainted"
St James's Palace would not be drawn on when the royal couple had become aware of the pregnancy, only saying "recently", but it is understood the palace announcement was prompted by the duchess's medical condition. The Queen, Prince Charles and other members of the Royal Family had been told about the pregnancy only earlier in the day. Prince William's brother, Prince Harry, who is serving with the Army in Afghanistan, is thought to have been told in an email. Prime Minister David Cameron wrote on Twitter that he was "delighted by the news...They will make wonderful parents." Labour leader Ed Miliband also tweeted: "Fantastic news for Kate, William and the country. A royal baby is something the whole nation will celebrate." Among those to offer congratulations from further afield were US President Barack Obama and his wife Michelle. Speaking to BBC 5 live, royal biographer Robert Lacey said: "It's a baby that we're all having. I mean we've seen them get married, we've lived through their courtship before that, we've been wondering when it's going to happen. "It's one of these unifying events that the monarchy is so good at producing." He added: "And of course an event like this is a great opportunity for everyone to air their views on the monarchy - and have a bit of fun as well." Royal historian Kate Williams told BBC News news of the baby had become "a frenzy" with the duchess on the front page of many newspapers in the UK and across the world. "This baby is the most sought after - the biggest celebrity baby really - in history," she said. In October 2011, Commonwealth leaders agreed to change succession laws so that the daughter of any future UK monarch will have the same right to the throne as a son. Under current laws, if a girl was born first to the couple, she would lose her place in line to the throne if a boy was born later. The law has not yet been altered but a Cabinet Office spokesman said formal consent was expected "very shortly" and ministers have indicated that the legislation will apply to any royal births from the date of the leaders' decision. The monarch is also head of the armed forces, supreme governor of the Church of England, head of state of the UK and 15 other Commonwealth countries.